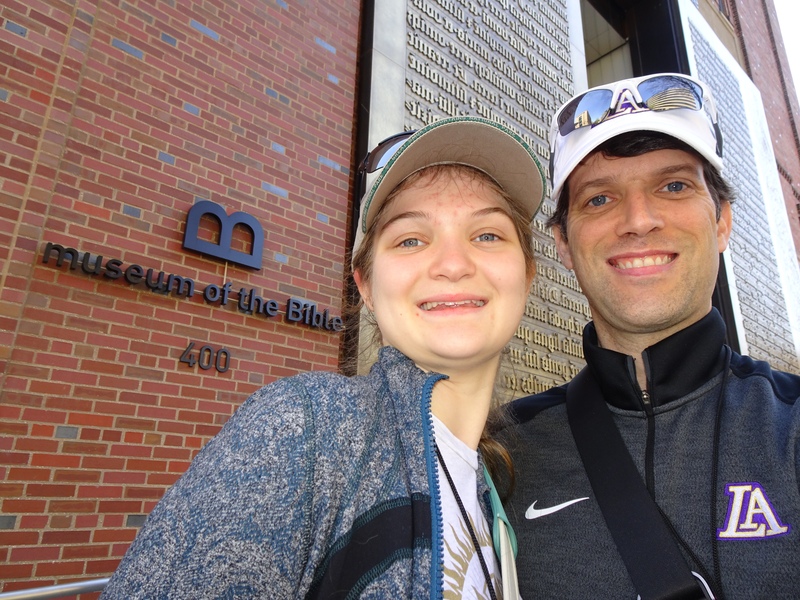 Our day started with a buffet breakfast in the Tennessee Dining Room at the 4-H Center, and then we boarded the bus for the Museum of the Bible, which opened in 2017. Upon arrival we were greeted by Heather who told us a little about the museum. She explained that it is comprised of seven floors and it would take nine days (8 hours each) to see and read everything that is on exhibit. She also told us about the world’s largest upside down LCD screen that covers the ceiling of the first floor. The first thing our group did was go to the third floor to visit the “Stories of the Bible” exhibit. We started with a 30 minute multimedia walkthrough of the Old Testament. This started with creation and worked it’s way all the way to the prophets. There were a couple of quotes in the presentations that stood out to me. In describing the fall of man in the Garden of Eden, the narrator said that “everything since the fall has been about repairing our relationship with God.” This is very much in line with my view of the Old Testament, but I had just never heard it worded that way. After the Old Testament walkthrough, we went to the New Testament section, which contained several recreations of the types of buildings that would have been found in villages during the time of Jesus. It also contained explanations of many of the items Jesus used in parables or were otherwise part of His ministry. In going through the section about Bible translations, there were two facts that stuck with me. The first is that it would have taken a scribe two to three years to hand write a copy of the Bible. The second was that by 200 AD the Bible was only available in 3 languages. This only increased to 13 over the next 400 years due to the time it took to write out the text. This changed dramatically with the invention of the printing press. 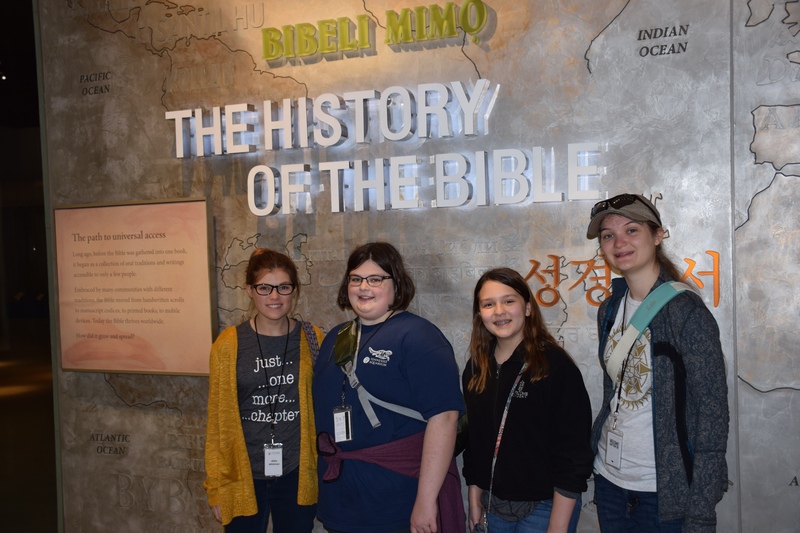 The final area we visited was called “Impact of the Bible in the World.” We had a very few minutes to spend here, but got to see Elvis’ personal Bible and a reproduction of the Gutenberg Press. The lady by the press gave a short demonstration of how each plate was inked and then pressed into the parchment. She said that each page would be pressed approximately 200 times before being moving onto the next page of the Bible (to make 200 copies). This process would be repeated 1300 time to make all the pages in the Bible. I would love to come back to this museum when I had an entire day to explore. This would especially be true of the “History of the Bible” exhibit which was incredible and very faith strengthening. Upon leaving the museum, we had lunch in the food court of the Ronald Reagan Building. Our afternoon was pretty heavy and emotional with stops at the United States Holocost Memorial Museum and Arlington National Cymetary. 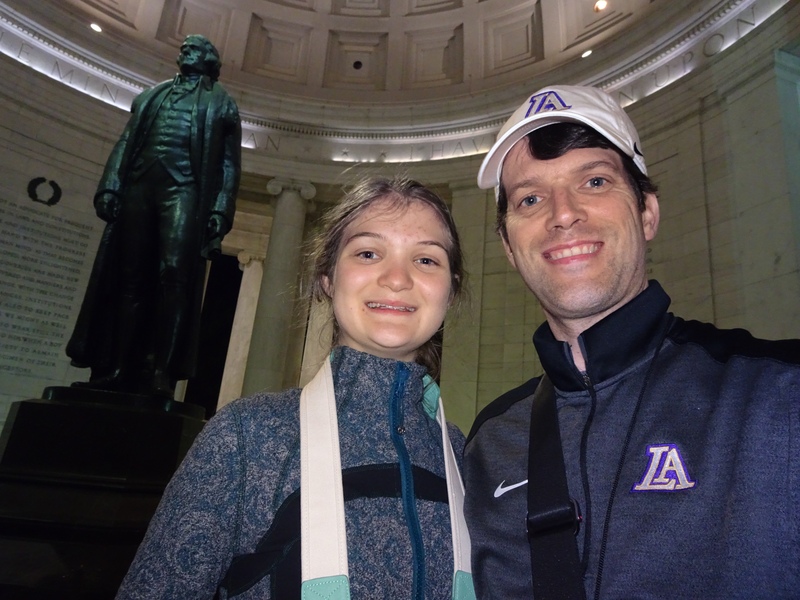 Both visits were sobering, but I’m glad they were included on our itinerary. 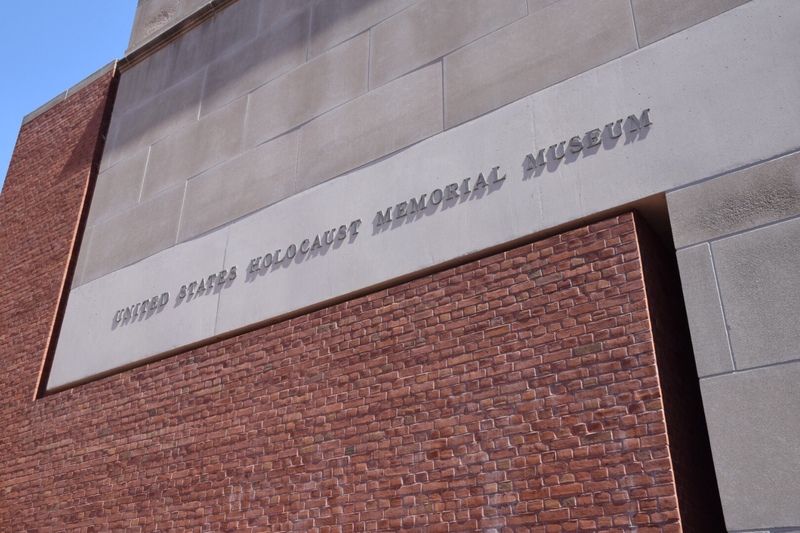 Going through the Holocost Museum was sobering. The only thing I can even remotely compare it to was visiting the 9/11 Museum in New York. To think that anyone was capable of so much hate that he could try and orchestrate the systematic elimination of an entire race of people is beyond comprehension. I knew the raw numbers of the Holocost, but learning about so many of the details was almost overwhelming. Scott Broadway then closed our time at the gravesite with a prayer. As we were getting ready to leave, three of the girls in our group, and one of the moms, sang “May The Lord Bless You and Keep You” by the gravestone. The whole thing was very moving. 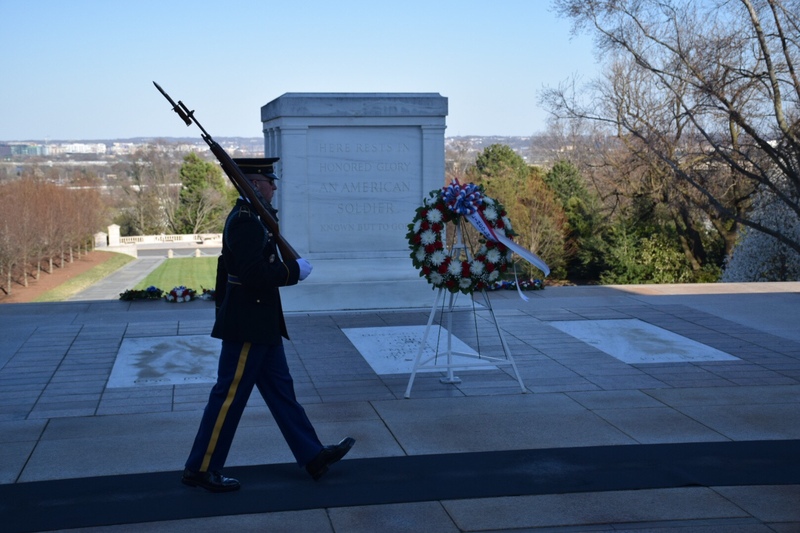 We the had a very long and brisk walk up the hill to the Tomb of the Unknown Soldier to see the changing of the guard. I still vividly remember this ceremony from when I visited as a kid and it was neat to share it this time with my daughter Kate. From there we had another long walk to John F. Kennedy’s tomb and the eternal flame. This is another thing that I remember vividly from being there as a kid. Even though it was somber, it was a beautiful day at Arlington with sunny skies and the cherry trees in full bloom. Dinner was at CiCi’s Pizza, which was quite a change of pace. The music was very loud and a bunch of the kids broke out into a spontaneous dance party and were joined by a few of the teachers and parents. 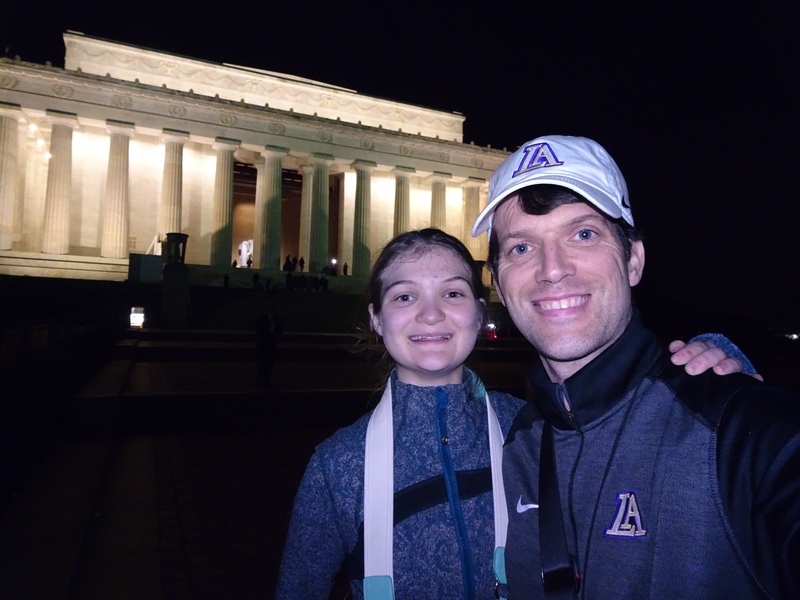 After dinner we headed out on a tour of monuments and memorials. Our first stop was the Pentagon Memorial dedicated to the 184 lives that were lost at the Pentagon on 9/11. The memorial is situated directly in line with where the plane hit the building. 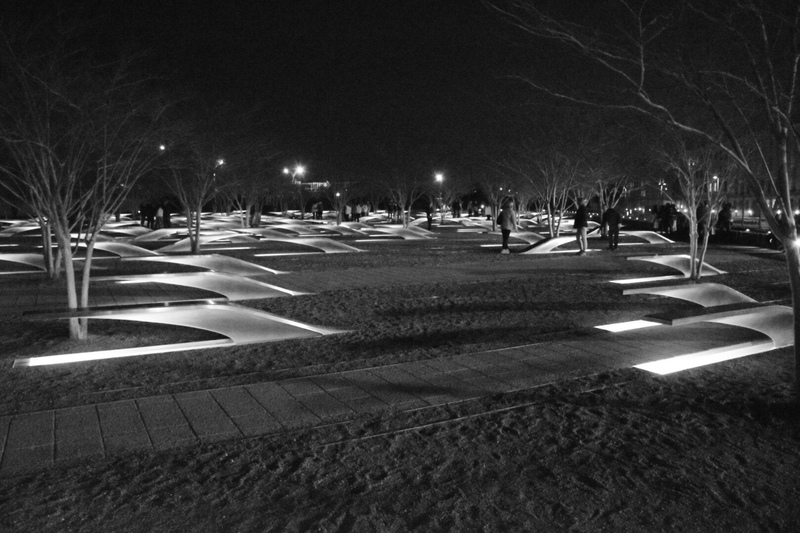 At the site, Franklin Bennett explained that the memorial contains a lighted bench for every victim arranged by age, beginning with a 3-year-old. These benches are angled in the direction that the plane flew into the Pentagon. If the bench is pointing toward the Pentagon, then it means that the victim was on the plane. If it is pointing away from the building then it means they were in the Pentagon. There is a wall that surrounds the memorial that progressively gets taller as the age of the victims increases. Beth Whitman (one of the chaperones & moms from our group) talked to all the students about her day on 9/11 that included the story of her dad who was flying to Washington and was on the last plane to land that day. Laura Smith (another chaperone and mom from our group) also shared her story to our group about her friend’s dad who was in one of the towers when it was hit. This was even more emotional for me than the Holocaust Museum because it brought back the feelings from that day. I talked to several students about my memories of the tragedy, and about how afraid I was when it happened. I tried to explain how much things have changed since then. I’ve thought about that every place we’ve visited this trip and had to go through security. None of that was the case when I was a kid. From there we made a quick stop at the Marine Memorial. 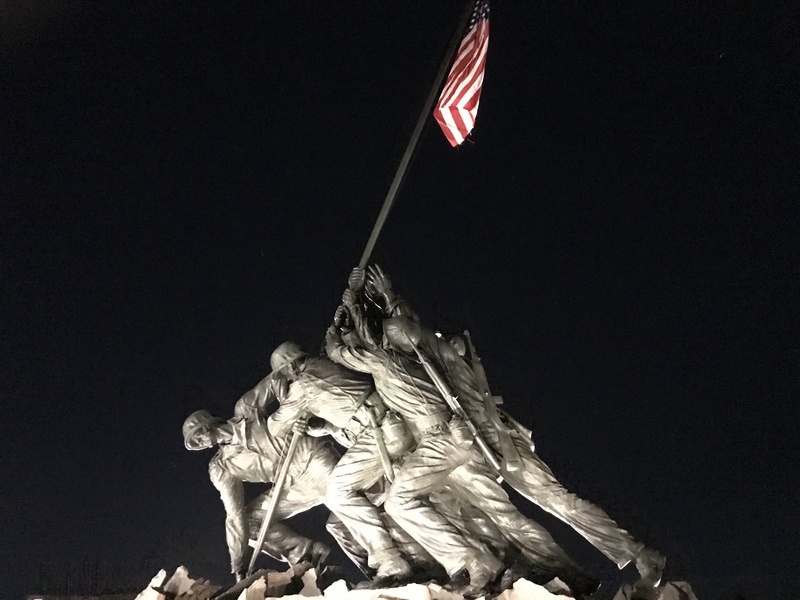 This is a statue that based on the famous photo from World War II of six Marines raising an American Flag on the island of Iwo Jima. 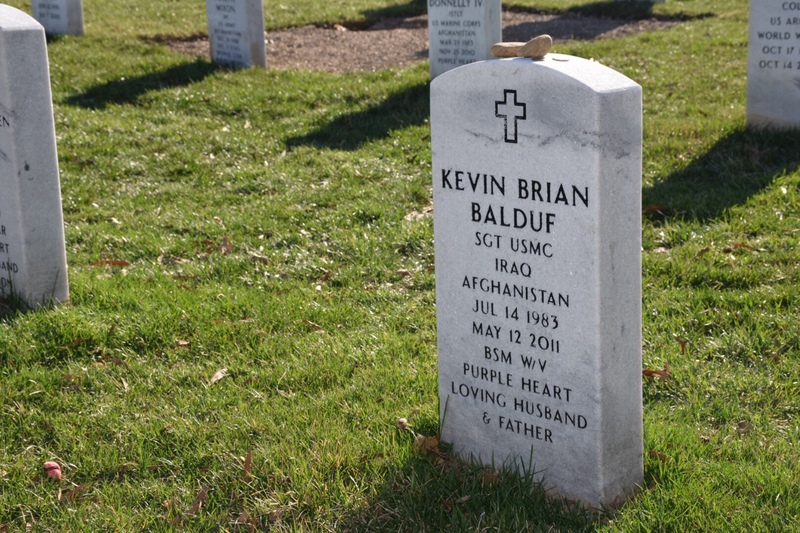 We learned that three of those Marines were dead within hours of the photo being taken. This was a long, busy, and emotional day. It started with a 6:00am alarm and now I’m writing this from the bus ride back to the 4-H Center at 11:00pm.